Laquey (pronounced "Lake-wāy") is an unincorporated community in Pulaski County, Missouri. It is about six miles southwest of Waynesville. It was founded in 1900 and named for the Laquey family. A post office called Laquey has been in operation since 1899. The community has the name of the local Laquey family. While the community is unincorporated, it is experiencing rapid growth due to its proximity to Fort Leonard Wood. The Laquey R-V School District had been for many years a K-8 district but in the early 1970s expanded to begin a high school. It's now the third-largest school district in Pulaski County, after Waynesville and Dixon. Route 133 runs north from Interstate 44 exit 145 about two miles east of Hazelgreen to Richland, Swedeborg, Crocker, and about two miles west of Dixon, then north out of the county. 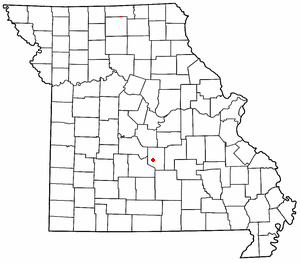 Route 7 runs north from Interstate 44 exit 150 about three miles west of Buckhorn to Richland, then north out of the county toward the Lake of the Ozarks region. Route 17 crosses Interstate 44 at exit 153 at Buckhorn, runs east through Waynesville, turns north to Crocker, and then runs north out of the county to Iberia. South of Interstate 44, Highway 17 hugs the western edge of Fort Leonard Wood, passes near Laquey, and circles south of the post until it runs out of the county and eventually joins Highway 32 in Roby. Laquey, Missouri Facts for Kids. Kiddle Encyclopedia.